You might have heard that "Black don't crack", but that does not necessarily mean that your African-American skin is immune to the signs of aging. So what is the black skin care industry's secret to soft, supple, flawless skin? How do models unclog their pores and get rid of any fine lines? For at home use, one of the answers is 10% Pharmaceutical grade glycolic acid. And we've got it bottled up with aloe vera extract to soothe and increase circulation. The Radiant & Clear Serum will keep your skin radiant and glowing. Click the Tab Above to Read Reviews From Satisfied Customers. How To Use: After cleansing and toning apply a very thin layer of serum every other night for 2 weeks. After two weeks apply nightly. After one month, you can begin to use morning and night. If your skin feels sensitive continue to use at night only. Ingredients:Aloe barbadensis gel, purified water (aqua), pharmaceutical quality glycolic acid, vegetable glycerine, tocopherol (vitamin E), allantoin, hydroxyethylcellulose and sorbic acid. I started off using the basic facial kit. I needed to work on my skin because I'd abused it from using irritating products that tore my skin up. It went from dry to dry dry from the alcohol in the products I was using. 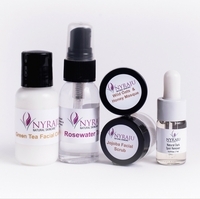 When I found Nyraju skin care, I was looking for hope. Once I got the basic facial kit, I then added the Radiant and Clear just to clear up some of the unevenness of my skin. It has really help even out my skin tone, I now buy it two at a time. I didn't think I would ever find a good Glycolic Serum that I could use without going to the dermatologist. I found it in the Radian and Clear. It's a really good product for treating uneven skin tones. It's gentle and non-invasive on my skin.